With the southern border of the United States gaining a very significant portion of news coverage especially when it comes to Donald Trump’s proclamations that the border region is a source of crime in the United States, a brief look at the 2018 National Drug Threat Assessment from the Department of Justice/Drug Enforcement Agency gives us interesting insight into how a border wall could impact the flow of drugs across the Mexico – United States frontier. 1.) 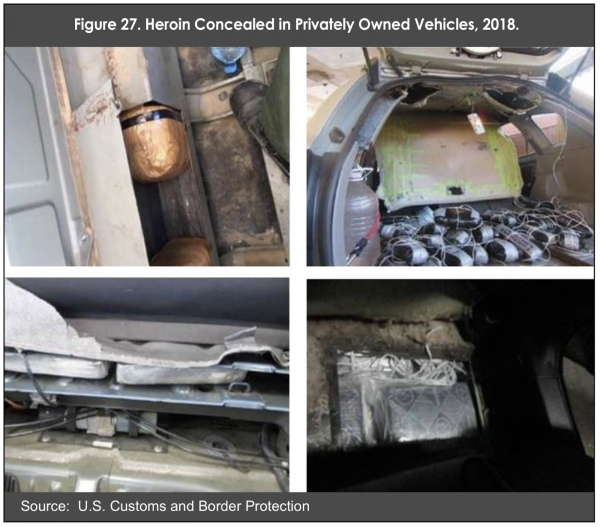 Heroin – Mexico is the primary source of heroin – significant increases in opium polly cultivation and heroin production allow Mexican Transnational Criminal Organizations (TCO) to supply high-purity, low-cost heroin into the U.S. market as U.S. demand has increased. 3.) Methamphetamine – most of America’s methamphetamines are produced in Mexico and smuggled across the Southwest Border (SWB). 4.) Marijuana – Mexico is the most significant foreign source of marijuana with the volume of seized marijuana decreasing across the SWB. Mexican drug traffickers are selling Mexico-sourced marijuana for use in THC extraction laboratories located in Southern California. Overall, the Mexican TCOs remain the greatest criminal drug threat to the United States with the Sinaloa Cartel maintaining the largest footprint in the United States. As well, in recent years, Cartel Jalisco Nueva Generacion’s (based in Guadalajara) footprint in the United States has expanded substantially. “Mexican TCOs transport the majority of illicit drugs into the United States across the SWB using a wide array of smuggling techniques. The most common method employed by these TCOs involves transporting illicit drugs through U.S. POEs (official Points of Entry) in passenger vehicles with concealed compartments or commingled with legitimate goods on tractor trailers. In some instances, regardless of method, the size of the loads has decreased, while the number of them has increased. Other cross-border smuggling techniques employed by Mexican TCOs include the use of subterranean tunnels, which originate in Mexico and lead into safe-houses on the U.S. side of the border. Underground tunnels are mainly used to smuggle ton quantities of marijuana, though there are instances of other illicit drugs commingled in shipments. Tunnels seized and destroyed by U.S. law enforcement authorities along the SWB are primarily found in California and Arizona, and are generally associated with the Sinaloa Cartel. Mexican TCOs also transport illicit drugs to the United States aboard commercial cargo trains and passenger buses. To a lesser extent, Mexican TCOs use maritime vessels off the coast of California. Mexican TCOs also rely on traditional drug smuggling methods, such as the use of backpackers, or “mules,” on clandestine land trails to cross remote areas of the SWB into the United States. 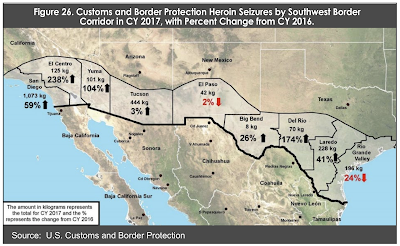 “In 2017, heroin from Mexico accounted for 91 percent (by weight) of the heroin analyzed through the DEA’s HSP. The annual United States Government estimate of Mexican Poppy Cultivation and Heroin Production found poppy cultivation reached a record high in 2017. Poppy cultivation in Mexico rose 38 percent, from 32,000 hectares in 2016 to 44,100 hectares in 2017. Similarly, potential pure heroin production increased by 37 percent, from 81 metric tons in 2016 to 111 metric tons in 2017. 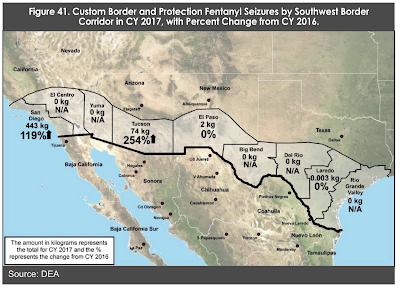 While I realize that the volume of drugs seized at the Southwest Border is likely a small fraction of the total drugs that cross the Mexico – United States border, it is interesting to see that the vast majority of both heroin and fentanyl is seized at official points of entry from either transport trucks or personal vehicles with only small volumes of these drugs being seized from individuals crossing the border illegally at points between official border crossings. 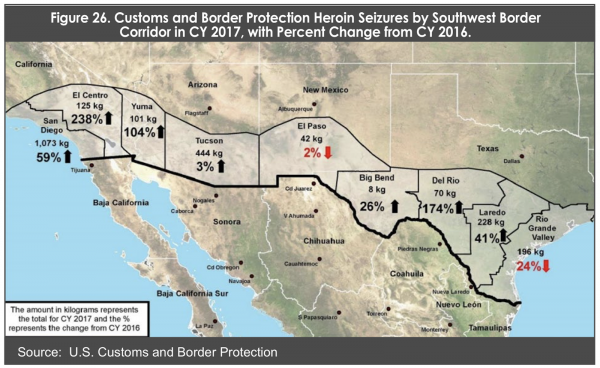 This would seem to indicate that the building of a continuous border wall will have relatively minimal impact on the volume of drugs imported into the United States from Mexico. 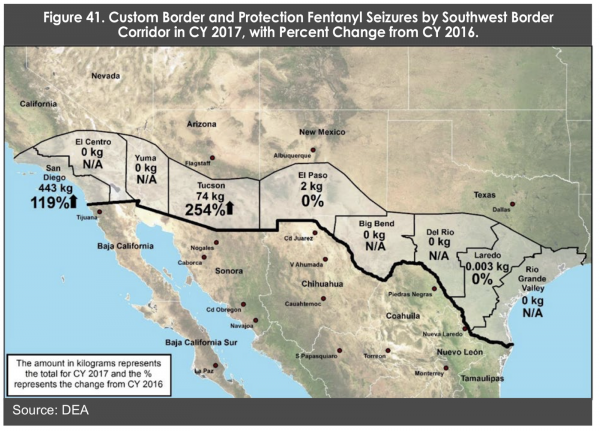 While a wall will make it more difficult for individual drug mules to smuggle relatively small volumes of illicit drugs into the United States, a wall is not going to stop people from importing illicit drugs using transport trucks, buses, personal vehicles and the myriad of other methods that involve crossing the border at official crossing points.